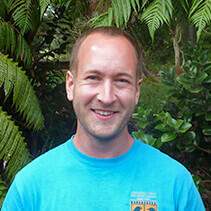 Donnie Alverson serves San Diego Zoo Global as a Research Associate in Recovery Ecology. He is based at the Keauhou Bird Conservation Center, where his responsibilities include the daily care of endangered Hawaiian forest bird species, including the palila, puaiohi, kiwikiu, and ʻalala. Diet preparation, behavioral observations, medical care, facility maintenance, and setting up perches in aviaries are just a few of the tasks he performs. His primary interests include avian incubation and hand-rearing. Donnie also conducts public outreach and education, including giving tours of the Center and speaking to school groups about the Hawaii Endangered Bird Conservation Program. The Center holds an annual open house, where Donnie gives talks and tours to local community members. He enjoys seeing people’s faces light up when they have the opportunity for a close personal experience with an endangered bird. Donnie earned his bachelor’s degree in Biology from Central Michigan University. While earning his undergraduate degree, he conducted research and a species inventory of bat populations on a 600-acre nature preserve in Michigan. Following this, Donnie completed an internship with the Toledo Zoological Society’s Avian Breeding Center. Prior to joining the Hawaii Endangered Bird Conservation Program, he worked in the Bird Department at Chicago’s Brookfield Zoo, primarily in the Avian Propagation Environment. In his free time, Donnie volunteers with the Hawaii Island Hawksbill Turtle Recovery Project. He enjoys snorkeling, camping, and cooking.